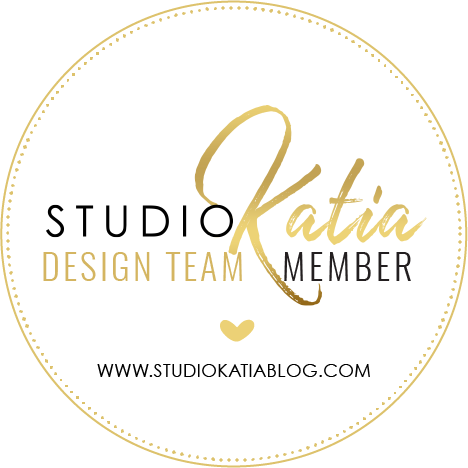 I am very excited to be part of the wonderful celebration today - Studio Katia is turning 1 today! And that means lots of inspiration and great prizes in the Birthday Celebration Blog Hop! You should have come here from Valentyna's blog. 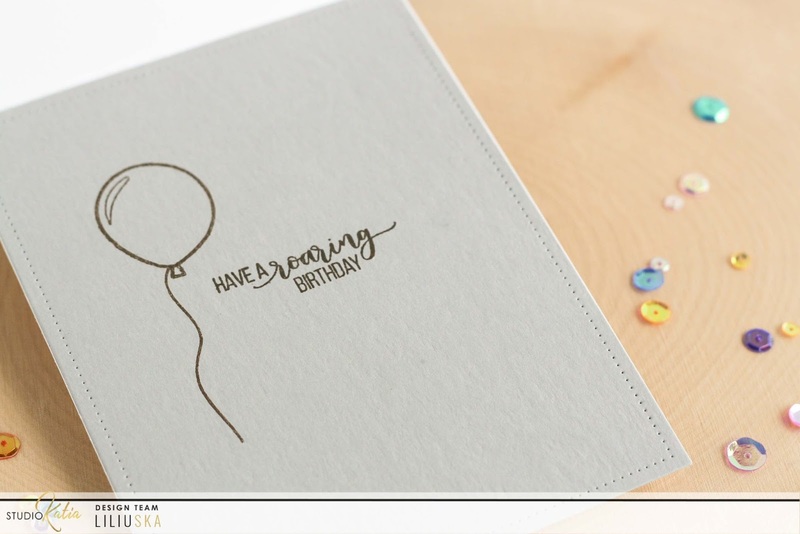 If not please head to the Studio Katia's blog for full list of blogs and all the details of the Studio Katia 1st Birthday Celebration Blog Hop. I made a Birthday shaker+slider card using Birthday Lions Clear Stamp Set. I stamped the lion and coloured it with Polychromos pencils. I wanted to cover the slider, so it wouldn't be visible. For that I stamped lots of balloons using couple masks. Imagine a room with tons of balloons under the sealing and this little lion hanging on one of them. Fun! I made shaker frame using Stitched Nested Creative Squares Creative Dies and filled it with Crystal Rainbow Fusion and Iridescent Rainbow Seed Beads. And stamped a sentiment inside. I love how this cute lion happily slides from side to side! Your next stop is Laurie. - You can also win Simon Says Stamp goody bag and Kuretake ZIG Clean Color Real Watercolor Brush Pens, 80 Color Set. The winners will be chosen from all the comments along the hop. - Studio Katia is offering 15% off all purchases to their online shop using the code "SKTURNS1" through Sunday, May 7th at midnight EST. What a super fun card, love the interactive element! And those sequins & their colours - ooooh, to die for! Such a fun and colorful card! Great design! Love this card! You did such a good job with the balloons!! A very exciting and happy card. What a fun, friendly and happy card! I love all the different color balloons! Great Birthday card! This card is a party in an envelope! So cute! So much fun, right here! Oh my goodness! Your card is fabulous!! I love the bunch of balloons and the texture of the colored pencil coloring... Plus the shaker colors and shape... FABULOUS! What a fun card! Love how you show how masking makes such a difference in card making! Such a super festve card! Think the child that recieves it will be sooo happy with it! So, So cute and love all of the balloons. Thanks for sharing. Great card! Love those balloons! Nice coloring! So much talent and inspiration in this hop! Thanks for sharing yours. HAPPY Birthday Studio Katia! What a Cute Fun card! Love it!! all those balloons, so much fun! What a cute, fun card! Love all the balloons. Super fun card - love the colors - great inspiration. Such a pretty and adorable card! 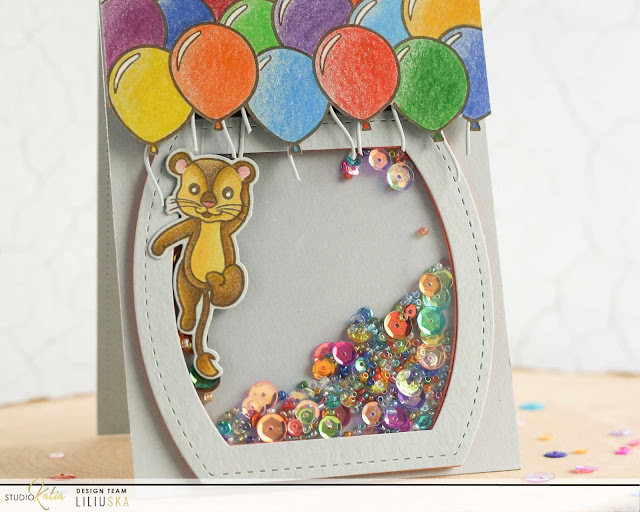 Love those layered balloons and the sequins together, just an exciting card! Such a fun and colorful card! Hats off to you for all that masking on those balloons! is a super funny and pretty card! such a cute shaker card :) love the coloring ! slider & shaker combo... what fun. and that sparkling duo of sequins and beads really sets it off. Super cute card! Looks like a birthday balloon bouquet! Fun! Beautiful card. Very creative. Thank you for sharing. Oh my gosh, what a great card! You really did a wonderful job. Very clever. This is so cute and adorable. Love the bright colors! Now this is a FUN card! Love the sentiments too. How sweet is that card! I love the stamp set! I love that it is a slider card and a shaker card! very festive!! Wow, amazing and fun card. Fun shaker card to celebrate Studio Katia's 1st birthday! Delightful card! Oh my gosh, how cute is your card! Love the lion and the slider idea; and, all the balloons! So colorful!! This is fun and adorable all in one! This is a party in a card! So fun! What a great card...fun and colorful. What's a birthday party without balloons, right? So fun and festive! Love, love, love all those balloons!!!! Great shaker card - HB to Studio Katia!!!! What a cute and colorful card. This is SO fun!! I just love all those balloons! Cute and fun card...thank you for sharing! A slider and a shaker! How clever! What a clever card design! Very clever and cute little card! Definitely my favorite card so far. It just put a smile on my face. Great job. What fun your card is... love everything about it, especially the bright, vibrant colors!! What a fun card!!!! Great product and the happiest of birthdays to them. I couldn't keep from smiling as soon as I saw the card, yes I can imagine a room full of balloons and the cute little monkey hanging from the ceiling. Who wouldn't love to receive this cheerful card on their Birthday. Fantastic... Thank You.., Blog hopping along. Oh, this card is adorable! I love the inactive part as well. Great for anyone! I love shaker cards and this one is stupendous. How great that you put in two fun elements! 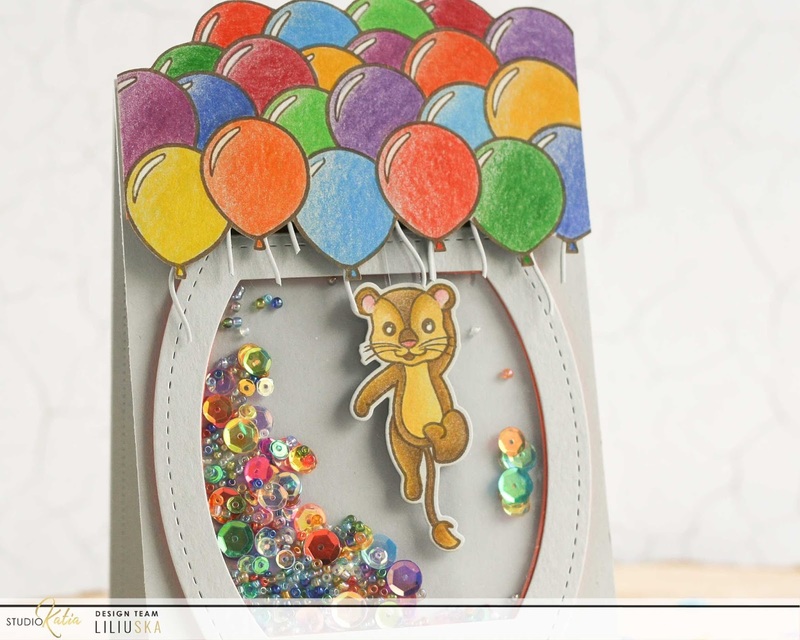 Love that little lion swinging under the balloons! Your card is so much fun. Just love the figure floating with the balloons. 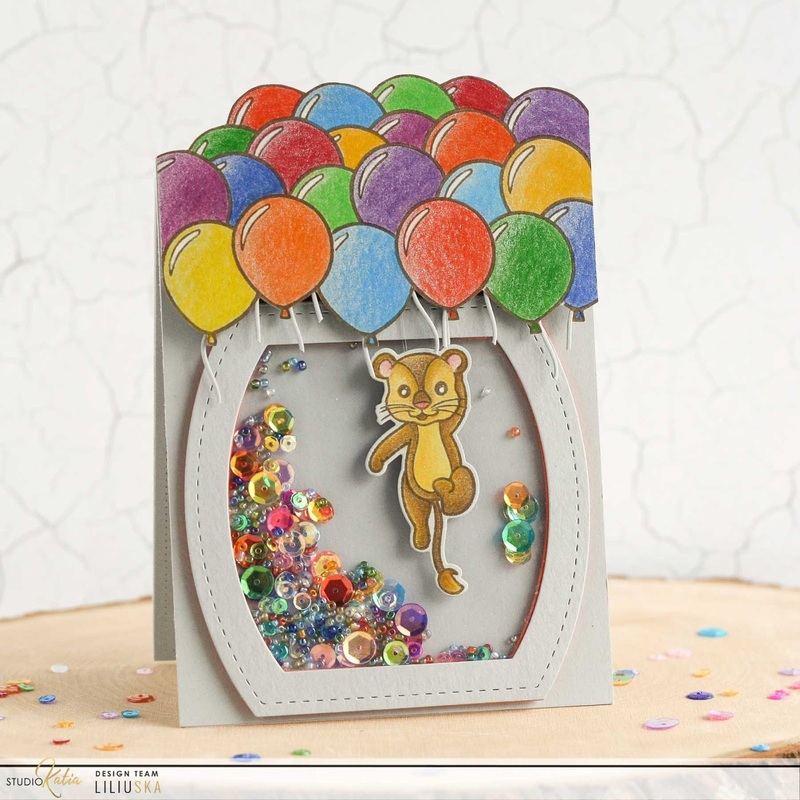 Thanks for sharing your card on this blog hop. What a fun card! My one grandson's birthday is coming up and he would love a card like this! 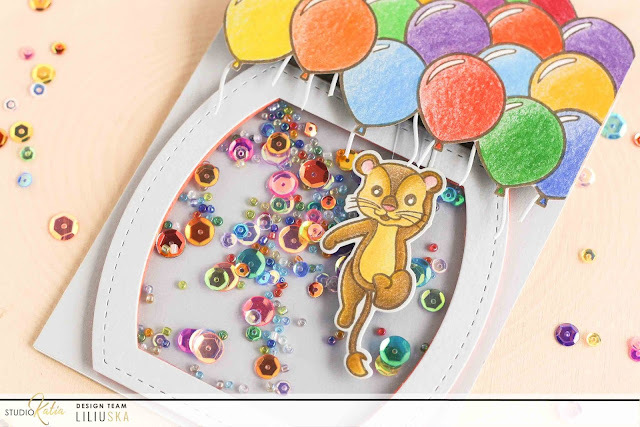 What a fun card with the sliding lion and the colorful balloon and sequins. Love how you matched the balloon colors with the sequins. O your card is so stinking cute. I love it and love all them balloons. Good job. What a fun shaker card, great design!! Such a fun birthday card! I love all of the balloons and the adorable lion! What a cheery and fun card!!!!!! What a fun card for a child's birthday. I love these cute critters. Darling shaker card. Liliuska, this is just fabulous! How amazingly adorable your card is! I love the slider. This is an adorable card very inspirational. Lots of color love It! Enjoy the movement of the animal! Thank you for sharing!! Fun, fun card! Love the balloons and the cute little lion cub! 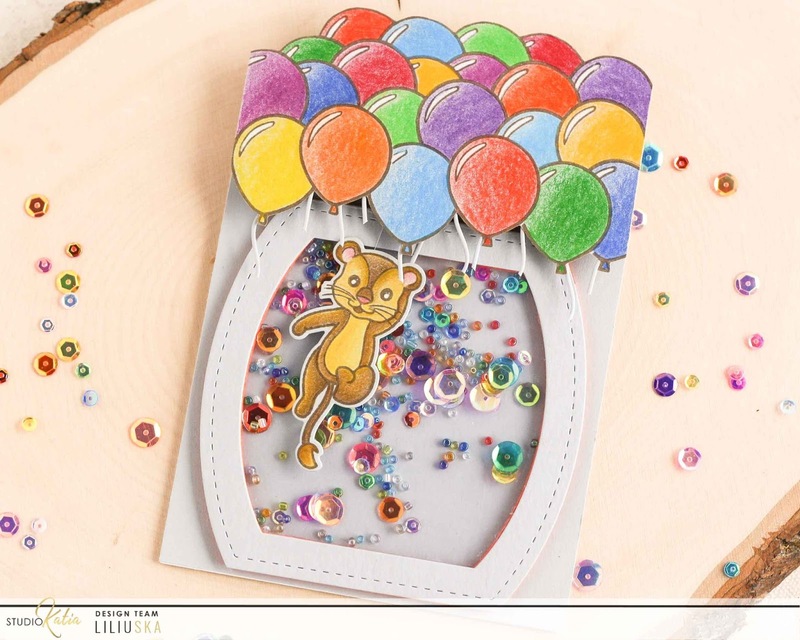 Such a fun card :) I can totally imagine a room filled with balloons with this cute little guy hand down; I wanna be there right now :) So adorable. Thanks for sharing. Too cute. The card itself is so fun and colorful and then the tiny lion slides. Love it. A fun card! Very nice! Love how colourful this card is! Ok it was really cute when I first saw it, but then when I noticed he might move! Oh so so Cute. I love making the grandkids unique cards! I must try this one. What a fun card. You out so much thought and love into that card, how awesome!! What a bright happy fun card! Thanks for sharing. Nice colouring, love the shaker element! What a cute shaker card! Love the fun images and colorful shaker contents. Those balloons are great - thanks for sharing! How clever to combine a slider element with a shaker card. This card will thrill the recipient. It is so much fun. Great coloring of the lion and balloons. What a fun, whimsical card! OH goodness this card is adorable!!!! It made me smile! Love all those colorful balloons everywhere and the colorful shaker elements! Lovely card! I love the lion...hes so cute!! Lovely card - very fun. Love the colourful balloons and how the sequins mirror them! Oh my stars! Your little lion, with his huge bouquet of balloons, takes 'cute and adorable' to an whole new level! The interactive feature: genius! So fitting that Katia has chosen shaker cards as her birthday theme, as she’s most definitely ‘shaken up’ our crafting community with her success! Thrilled that you're part of it! Awww!!! Adorable shaker card!!! Too cute!!! What a fun and happy card. Thank you for sharing your ideas! I love this card! Thank you for sharing and for the chance to win. Very creative card combining a shaker and a slider! I love your card, a shaker and a slider card all in one, so fun! I adore the beautiful vibrant colours that you used and your colouring is fantastic and of course the lion is so adorable. Such HAPPY HAPPY Balloons! I love your pretty sequins and beads, they are so pretty! FAB card! Love your lion birthday card very colorful. Thank you for sharing your Inspiration. Love all those balloons. Really fun to see the lion moving around like that. Thanks for all you hard work. So cute!! I love all the balloons!! This card is gorgeous! Thank you so much for inspiring us to continue being creative in new and beautiful ways. A very Happy Birthday! AWESOME shaker card, Love the balloons, Shakers are so fun! I hope Google has my account figured out. It kept kicking me off and making me sign in again. I love all the colors on your card! They are so me! Those are the colors I would use on my card if I made it. I love colored pencils and I would also have used markers and water colors too. I watched the video and the lion moves! That is so cool! I also love how you used sequins and seed beads. I would never think to mix them. My nephew and niece who are 19 and 22 would totally love this card as much as I do. Congrats on Studio Katia's 1st anniversary and for giving us the chance to win something. What a fun slider shaker card!! Awesome idea! A shaker with a huge balloon bouquet and a cute lion sliding from side to side is brilliant. Fun hop! Wow! Such a beautiful shaker card!! What a creative and fun card! Who wouldn't want to receive that in the mail. Super sweet and happy card! I love that adorable lion cub. So fun! Love all those balloons and that they go off the edge at the top. What a fun card. Someone will be very lucky to receive it! This is really a cute shaker card. Such a fantastic, colourful shaker and love all the sequins and seed beads you used too!! Oh My gosh! One of the most adorable cards I have ever seen. The colors and design are awesome. Thanks so much for sharing your inspiration. I have somehow missed out on your blog and must subscribe. Thanks again for the wonderful idea. Gorgeous card! Love the colors, and the coloful shaker mix is so bright and colourful. Thanks for inspiring us! Очень красиво!!! интересный такой интерактив!!! What an awesome interactive card. So cute, bright and fun. Love that flock of balloons. Wow! Fabulous card. The interactive elements are so clever and the coloring is spectacular!! Absolutely love it. Lots of goodness all in one place. Slider and shaker.. Awesome! Love these cards. Always loved shakers and slider. very cute.